How can science centers and museums work to welcome and include all audiences? 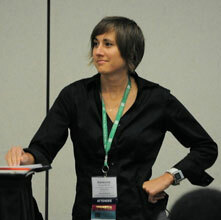 A group of museum practitioners convened on Tuesday, October 18, at the 2011 ASTC Annual Conference in Baltimore to hear how science centers are working with lesbian, gay, bisexual, and transgender (LGBT) communities. The first presenter in the session, entitled “Diversity in Practice: Case Studies in Increasing Equity in Museums,” was Eric Godoy of the California Academy of Sciences in San Francisco. Godoy detailed several initiatives, ranging from silly (hosting a “Tranimal Drag Contest”—the winner wore an anglerfish costume) to the serious (producing a video as part of the It Gets Better Project to provide hope for LGBT youth facing bullying). As Adrienne Barnett of the Exploratorium in San Francisco took the floor, she explained, “Eric and I have a friendly rivalry to make our institutions as LGBT-friendly as possible. When I saw the California Academy had an It Gets Better video, I thought, obviously, the Exploratorium has to do one.” Upper management and staff immediately and overwhelmingly supported Barnett’s idea. According to Barnett, the making of the video “was a huge, pivotal moment in history of the Exploratorium. It showed that we have acceptance throughout the institution.” The Exploratorium has had domestic partner policies for staff in place for 12 years and uses inclusive language (such as “spouse” and “partner,” rather than “husband” and “wife”) in materials for its staff and the public. Next, Kevin Seymour described the LGBT-inclusion efforts of COSI, Columbus, Ohio, which began more recently with a visitation survey in 2009. The center now partners with a local youth center and participates in the Columbus Pride Festival. Finally, session leader Timothy Hecox of the Oregon Museum of Science and Industry (OMSI) in Portland described joining OMSI’s diversity workgroup, which has reaching out to the LGBT community among its goals. On November 7, OMSI will host its first family science night geared specifically for LGBT families. “To my knowledge, this [will be] the largest event for this specific community that’s ever happened in Portland,” Hecox said. He also plans to form an ASTC Community of Practice to support diversity committees and workgroups in science centers and museums. Following the presentations, the participants split into small groups to create their own action plans for serving LGBT audiences or other diverse communities.